To discuss the challenges faced by the medical community in managing patients with allergic rhinitis, and to brainstorm potential strategies to improve the identification and treatment of allergic rhinitis, an advisory group of allergy experts and payer representatives was convened on May 6, 2017, in Jersey City, NJ, to develop actionable, strategic, and tactical recommendations for all healthcare system stakeholders committed to delivering high-quality care for patients with allergic rhinitis. To that end, the sponsor of the panel discussion sought to identify reasons for variation in the care of patients with allergic rhinitis, discuss systemwide opportunities for providers and payers to improve patient care, and share with clinicians and payers best practices to consider when developing optimal allergic rhinitis management strategies. This advisory panel reviewed the current standards of allergic rhinitis care based on clinical guidelines and discussed the central role of pharmacotherapy in maintaining disease control and minimizing the burden of illness, recognizing the balance between burden of disease and burden of therapy. The panel also discussed potential research avenues to generate evidence supporting timely allergic rhinitis identification and treatment. Within this context, the group also addressed the role of combination pharmacotherapy for the treatment of patients with allergic rhinitis in a value-based care paradigm, particularly with respect to clinical outcomes and patient adherence to therapy. In addition, skin rashes, earaches, and conjunctivitis were identified as relatively common comorbidities in patients with allergic rhinitis compared with people without allergic rhinitis. Furthermore, 38% of adults with allergic rhinitis reported a previous diagnosis of asthma compared with only 8% of adults without allergies. Overall, 52% of patients with comorbid asthma reported that their asthma got better when their allergic rhinitis symptoms were controlled, and 37% reported no change.1,2 Similarly, improvement in disease control generally leads to reduction of the consequences of other comorbidities associated with allergic rhinitis. Although the symptoms can be debilitating, allergic rhinitis may remain undiagnosed when patients do not seek medical attention. In a European telephone survey, 45% of patients who reported signs and symptoms of allergic rhinitis had never been diagnosed by a physician.3 These findings are consistent with the professional experience of the allergists represented on the advisory panel, who noted that many patients self-treat with over-the-counter drugs, whereas others do not use treatment at all, resulting in a substantial proportion of patients never being clinician-diagnosed with allergic rhinitis. The rhinitis practice parameter from the Joint Task Force (JTF) on Practice Parameters, developed in collaboration between the American Academy of Allergy, Asthma & Immunology and the American College of Allergy, Asthma & Immunology, is intended for allergy specialists and other physicians who treat allergic rhinitis.6 The practice parameter, last updated in 2008, is currently undergoing review, and an updated parameter is expected to be published in 2017. The JTF on Practice Parameters categorizes allergic rhinitis treatment recommendations in a stepwise process according to disease severity level, as shown in the Figure.6 Another goal is to proactively intervene before allergen exposure to reduce the risk for an acute event. Several interventional strategies are used to help patients manage their allergic rhinitis symptoms. Environmental controls, such as pet removal, air filtration systems, and acaricides to kill dust mites, may help to alleviate symptoms for some patients.4,6 Nasal saline irrigation is generally well-tolerated and may also be beneficial.28 For the majority of patients, however, pharmacotherapy will be required. Participating allergy specialists on the advisory panel noted that oral decongestants, such as pseudoephedrine or phenylephrine, and intranasal decongestants, such as phenylephrine and oxymetazoline, are sometimes used to treat the congestion of episodic allergic rhinitis; however, they have limited effectiveness in controlling other allergic rhinitis symptoms. Oral antihistamines are very often used but are limited in addressing nasal congestion—again, the most bothersome symptom of allergic rhinitis. Intranasal antihistamine therapies offer several advantages, including faster onset than oral antihistamines and greater efficacy. Intranasal corticosteroids were cited as the most effective monotherapy in allergic rhinitis. Immunotherapy may also be considered for patients who have not achieved control with pharmacotherapy. The panel agreed that multiple medications were typically necessary to achieve disease control in patients with moderate-to-severe allergic rhinitis. Several allergy specialists noted that concomitant therapy with an intranasal antihistamine and an intranasal corticosteroid worked well for many patients. Available combination formulations allow patients to administer 2 agents simultaneously in a single dose. Dymista, for example, is a fixed-dose intranasal combination therapy that includes fluticasone propionate (a corticosteroid) plus azelastine hydrochloride (an H1-receptor antagonist).29 Panel participants agreed that the efficacy and safety data in support of the use of this fixed-dose combination treatment were compelling, particularly because Dymista was studied in head-to-head clinical trials and not just in studies comparing each of the individual components versus placebo.25,30 Similarly, they noted that a lower spray volume in the combination medication was required to achieve clinical benefit compared with sequential use of individual agents. Although the panel experts were supportive of the clinical trials data, participating payers expressed some concern about the use of the combination medication, seeking to ensure that Dymista is used according to the drug label and prescribing information in patient populations most likely to benefit from such combination treatment. The participants were therefore interested in characterizing the optimal patient profile for Dymista, noting that a combination of clinical and real-world data may be needed to develop this evidence. For example, the practicing healthcare provider has historically focused on the needs of individual patients rather than on populations of patients. This has changed to some degree as physicians are increasingly held to standards of performance measurement and “accountability.” Nonetheless, in allergic rhinitis, allergy specialists are focused on risk reduction and symptom control, which directly affect patient health outcomes. Allergists participating on the panel cited the additional importance of the relationship between the upper and lower airways, and individualizing treatment to respond to the patient’s full spectrum of pathology rather than focusing only on the upper airways. Clinicians are also concerned about patient access to treatment. Although clinicians understand the need for payers to control costs, the increased use of step-therapy protocols can frustrate physicians and increase the burden on patients. Within the value-based healthcare paradigm, increasing emphasis is placed on shared decision-making, and patients (as the recipients of healthcare) are encouraged and educated to be more accountable for their own care; thus, their perspective is critical. However, in allergic rhinitis, the data show that the majority of patients are dissatisfied with their allergy treatment and expect better outcomes than they are currently experiencing.26 At the same time, patients may be self-treating their allergic rhinitis without being aware of the treatment options that are likely to provide them with the best therapeutic benefits. As discussed at the advisory board meeting, payers and employers have a more economically directed perception of value that focuses on the health of populations rather than on individual patients. Payers typically regard the clinical utility of a treatment or procedure relative to net cost, where clinical utility is measured by the outcome experienced by the patient. Payers will often weigh the relative value of treating various diseases as well as the relative value of one treatment versus another. This perspective may lead to the implementation of a number of utilization management strategies that may encourage providers and/or patients to favor one option over another. In addition, payers stratify their member populations in an effort to recommend treatments that provide the most benefit to subgroups of members based on specific demographic or disease characteristics. Employers also focus on population health; however, their primary goals are to reduce workplace absenteeism and maintain employee productivity, while containing their contribution to healthcare premiums. Like allergy specialists, participating payers also sought to improve outcomes, albeit usually in an economic context. However, they noted that direct cost-savings from averted emergency department visits and hospitalizations are more challenging to quantify in allergic rhinitis than in conditions such as asthma and chronic obstructive pulmonary disease, for example, because allergic rhinitis is frequently listed as a secondary diagnosis, and it may be difficult to ascertain the contribution of allergic rhinitis to an acute event relative to other comorbidities that may be involved. Because of this limitation, it may be impractical for some health systems to evaluate risk reduction in allergic rhinitis. However, a payer representative on the panel stated that his organization, a large integrated health system, had successfully implemented an intervention to reduce hospitalizations and emergency department utilization in patients with asthma and chronic obstructive pulmonary disease, noting that comorbid allergic rhinitis was a criterion used to flag patients for intervention. As the first point of contact for patients seeking medical care, primary care providers (PCPs) play a critical role in identifying and managing allergic rhinitis. Because these physicians often diagnose and initiate allergic rhinitis therapy in patients, there is a need for education that promotes treatment strategies that align with current clinical practice guidelines and treatment paradigms. However, advisors noted that many PCPs and some otolaryngologists were unfamiliar with the JTF on Practice Parameters and cited the need for heightened awareness of this consensus document to help guide treatment decisions in an evidence-based, stepwise process. According to participating advisors, these discussions should include broader efforts to educate PCPs using interactive teaching techniques on the proper use of over-the-counter versus prescription products. However, patient factors may sometimes hinder clinical evaluation of allergic rhinitis. For example, patients, including children, may not recognize or accurately characterize their symptoms; they may also seek care outside the care of a physician. As a result, participating advisors cited the ongoing need for effective patient education to help facilitate identification and appropriate treatment of allergic rhinitis. This is echoed by survey data showing that nearly 9 of 10 patients with allergic rhinitis and almost all PCPs and allergy specialists stressed the need for better patient education about the disease and its treatment options.26 Patients must understand the disease and the available treatment options as well as the chronic nature of allergic rhinitis, the goals of therapy, the impact of allergic rhinitis on comorbidities, and the importance of treatment adherence in disease control. Allergic rhinitis is often underdiagnosed and undertreated. A limited awareness of allergic rhinitis, its associated comorbidities, and effective treatment strategies all contribute to suboptimal identification and management of allergic rhinitis. In addition, patients often self-treat, and when they seek medical care, they may be seen by providers representing different disciplines, including primary care, otolaryngology, and allergy/immunology. The lack of awareness of and adherence to consensus guidelines was repeatedly cited as a key barrier to improved care and better patient outcomes. 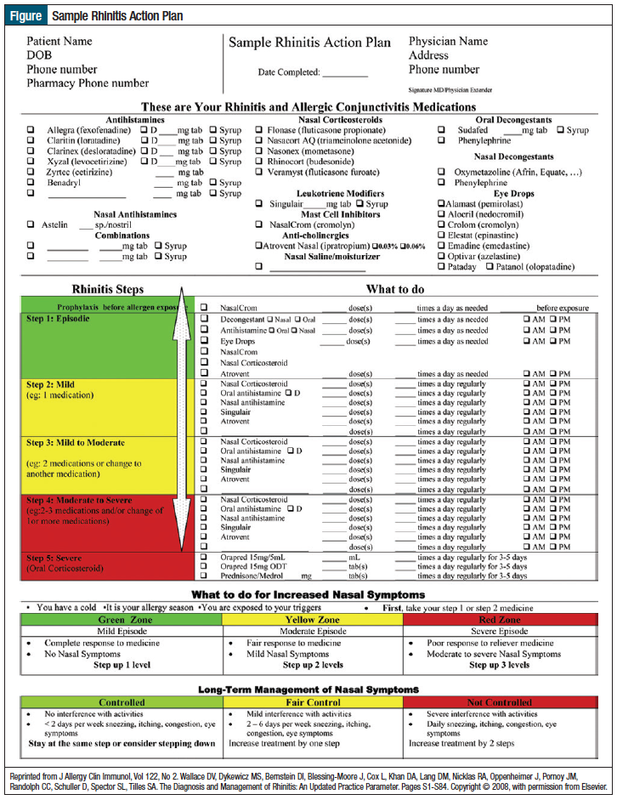 It is important for providers to ensure that allergic rhinitis therapy is individualized, because each patient has varying levels of severity and duration of symptoms, disease etiology, and environmental triggers, as well as the presence or absence of various comorbidities that can impact treatment. The JTF on Practice Parameters recommends that providers take a stepwise approach to treatment using efficient shared decision-making aids for patients with moderate-to-severe allergic rhinitis. Because evidence suggests that fixed-dose combination therapies, such as Dymista, are safe and effective in helping patients maintain disease control, they should be offered as an alternative treatment for patients with poorly controlled allergic rhinitis. Finally, patients who cannot achieve disease control using pharmacotherapies may be considered for immunotherapy and, in specific cases, surgery. Advisors agreed that ongoing synergistic and simultaneous education of providers and patients is needed to improve the delivery of guideline-concordant care, which, in turn, leads to better adherence to treatment and thereby better patient outcomes. Policymakers, professional organizations, payers, and manufacturers can all play a role in helping develop and disseminate evidence-based programs and resources that can serve to educate patients and healthcare professionals on effective strategies to reduce the negative impact of allergic rhinitis and improve QOL. Dr Meltzer is Consultant to Allergan, AstraZeneca, Boehringer Ingelheim, Johnson & Johnson, and Regeneron/Sanofi; Speaker for Merck; and Consultant to and Speaker for GlaxoSmithKline, Glenmark, Stallergenes Greer, Mylan, and Teva. Dr Bukstein is Speaker for ALK, AstraZeneca, Circassia, Genentech, Mylan, Novartis, Stallergenes Greer, and Teva. Dr Hamrah is a member of the Advisory Board of Mylan. Dr Scott and Mr Welz are employees of The Lynx Group. 1. Meltzer EO. Allergic rhinitis: burden of illness, quality of life, comorbidities, and control. Immunol Allergy Clin North Am. 2016;36:235-248. 2. Hadley JA, Derebery MJ, Marple BF. Comorbidities and allergic rhinitis: not just a runny nose. J Fam Pract. 2012;61(2 suppl):S11-S15. 3. Bauchau V, Durham SR. Prevalence and rate of diagnosis of allergic rhinitis in Europe. Eur Respir J. 2004;24:758-764. 4. Seidman MD, Gurgel RK, Lin SY, et al; for the Guideline Otolaryngology Development Group. AAO-HNSF. Clinical practice guideline: allergic rhinitis. Otolaryngol Head Neck Surg. 2015;152(1 suppl):S1-S43. 5. Bousquet J, Khaltaev N, Cruz AA, et al. Allergic rhinitis and its impact on asthma (ARIA) 2008 update (in collaboration with the World Health Organization, GA(2)LEN and AllerGen). Allergy. 2008;63(suppl 83):8-160. 6. Wallace DV, Dykewicz MS, Bernstein DI, et al; for the Joint Task Force on Practice Parameters; American Academy of Allergy, Asthma & Immunology; American College of Allergy, Asthma and Immunology; Joint Council of Allergy, Asthma and Immunology. The diagnosis and management of rhinitis: an updated practice parameter. J Allergy Clin Immunol. 2008;122(2 suppl):S1-S84. Erratum in: J Allergy Clin Immunol. 2008;122:1237. 7. Klossek JM, Annesi-Maesano I, Pribil C, Didier A. The burden associated with ocular symptoms in allergic rhinitis. Int Arch Allergy Immunol. 2012;158:411-417. 8. Brożek JL, Bousquet J, Baena-Cagnani CE, et al; for the Global Allergy and Asthma European Network, and the Grading of Recommendations Assessment, Development and Evaluation Working Group. Allergic Rhinitis and its Impact on Asthma (ARIA) guidelines: 2010 revision. J Allergy Clin Immunol. 2010;126:466‑476. 9. Centers for Disease Control and Prevention. National Ambulatory Medical Care Survey: 2010 summary tables. www.cdc.gov/nchs/data/ahcd/namcs_summary/2010_namcs_web_tables.pdf. Accessed July 10, 2017. 10. Meltzer EO, Bukstein DA. The economic impact of allergic rhinitis and current guidelines for treatment. Ann Allergy Asthma Immunol. 2011;106(2 suppl):S12-S16. 11. Reed SD, Lee TA, McCrory DC. The economic burden of allergic rhinitis: a critical evaluation of the literature. Pharmacoeconomics. 2004;22:345-361. 12. Harper A; for the WHOQOL group. WHOQOL-BREF: introduction, administration, scoring, and generic version of the assessment. Field trial version. December 1996. www.who.int/mental_health/media/en/76.pdf. Accessed June 18, 2017. 13. Nathan RA. The burden of allergic rhinitis. Allergy Asthma Proc. 2007;28:3-9. 14. Kay GG. The effects of antihistamines on cognition and performance. J Allergy Clin Immunol. 2000;105(6 pt 2):S622-S627. 15. de la Hoz Caballer B, Rodríguez M, Fraj J, et al. Allergic rhinitis and its impact on work productivity in primary care practice and a comparison with other common diseases: the Cross-Sectional Study to Evaluate Work Productivity in Allergic Rhinitis Compared with Other Common Diseases (CAPRI) study. Am J Rhinol Allergy. 2012;26:390-394. 16. Egan M, Bunyavanich S. Allergic rhinitis: the “Ghost Diagnosis” in patients with asthma. Asthma Res Pract. 2015;1:8. 17. Ponte EV, Franco R, Nascimento HF, et al. Lack of control of severe asthma is associated with co-existence of moderate-to-severe rhinitis. Allergy. 2008;63:564-569. 18. Butz A, Morphew T, Lewis-Land C, et al. Factors associated with poor controller medication use in children with high asthma emergency department use. Ann Allergy Asthma Immunol. 2017;118:419-426. 19. Price D, Zhang Q, Kocevar VS, et al. Effect of a concomitant diagnosis of allergic rhinitis on asthma-related health care use by adults. Clin Exp Allergy. 2005;35:282-287. 20. Corren J, Manning BE, Thompson SF, et al. Rhinitis therapy and the prevention of hospital care for asthma: a case-control study. J Allergy Clin Immunol. 2004;113:415-419. 21. Sayın İ, Cingi C, San T, et al. An important social problem: allergic rhinitis. J Med Updates. 2013;3:91-95. 22. Sundberg R, Torén K, Höglund D, et al. Nasal symptoms are associated with school performance in adolescents. J Adolesc Health. 2007;40:581-583. 23. Kim SH, Won HK, Moon SD, et al. Impact of self-reported symptoms of allergic rhinitis and asthma on sleep disordered breathing and sleep disturbances in the elderly with polysomnography study. PLoS One. 2017;12:e0173075. Erratum in: PLoS One. 2017;12:e0176425. 24. Stewart MG. Identification and management of undiagnosed and undertreated allergic rhinitis in adults and children. Clin Exp Allergy. 2008;38:751-760. 25. Bachert C, Cardell LO. The journey from unmet need in allergic rhinitis to rationale for, and clinical development of, a new treatment option, MP29-02. Clinical Practice (Therapy). 2014;11:413-424. 26. HealthSTAR Communications; Schulman, Ronca & Bucuvalas. Allergies in America: a landmark survey of nasal allergy sufferers: executive summary: adult. February 2006. www.worldallergy.org/UserFiles/file/Allergies%20in%20America%20(AIA)%20-%20Adult%20Executive%20Summary.pdf. Accessed June 20, 2017. 27. Diwakar L, Cummins C, Lilford R, Roberts T. Systematic review of pathways for the delivery of allergy services. BMJ Open. 2017;7:e012647. 28. Chen JR, Jin L, Li XY. The effectiveness of nasal saline irrigation (seawater) in treatment of allergic rhinitis in children. Int J Pediatr Otorhinolaryngol. 2014;78:1115-1118. 29. Dymista (azelastine hydrochloride and fluticasone propionate) nasal spray [prescribing information]. Somerset, NJ: Meda Pharmaceuticals; February 2015. 30. Bousquet J, Bachert C, Bernstein J, et al. Advances in pharmacotherapy for the treatment of allergic rhinitis; MP29-02 (a novel formulation of azelastine hydrochloride and fluticasone propionate in an advanced delivery system) fills the gaps. Expert Opin Pharmacother. 2015;16:913-928. 31. Porter ME. What is value in health care? N Engl J Med. 2010;363:2477-2481. 32. Schatz M, Meltzer EO, Nathan R, et al. Psychometric validation of the Rhinitis Control Assessment Test: a brief patient-completed instrument for evaluating rhinitis symptom control. Ann Allergy Asthma Immunol. 2010;104:118-124. 33. Meltzer EO, Schatz M, Nathan R, et al. Reliability, validity, and responsiveness of the Rhinitis Control Assessment Test in patients with rhinitis. J Allergy Clin Immunol. 2013;131:379-386. 34. Wilson SR, Strub P, Buist AS, et al; for the Better Outcomes of Asthma Treatment (BOAT) Study Group. Shared treatment decision making improves adherence and outcomes in poorly controlled asthma. Am J Respir Crit Care Med. 2010;181:566-577. 35. Bender BG. Motivating patient adherence to allergic rhinitis treatments. Curr Allergy Asthma Rep. 2015;15:10. 36. Yang HJ, Kim YH, Lee B, et al; for the Work Group for Rhinitis, the Korean Academy of Asthma, Allergy and Clinical Immunology. Unmet primary physicians’ needs for allergic rhinitis care in Korea. Allergy Asthma Immunol Res. 2017;9:265-271. 37. Bukstein D, Parikh R, Eid S, et al. Beclomethasone Dipropionate Nasal Aerosol in Patients with Perennial Allergic Rhinitis (BALANCE) study: 6-month results. Allergy Asthma Proc. 2016;37:121-130.